"I aspire to raise my race from the mire. I will bring them to equal standing with the other races of Tamriel…My goal is not to conquer Tamriel, but to create the orcish [sic] homeland." The story of Gortwog gro-Nagorm is the story of Orsinium's rebirth. Tales say he acquired land near the former site of Orsinium after winning a duel in 3E 399. He then constructed a new city, also named Orsinium, for his people within the nascent Orsinium Area, ruling from his citadel of steel. But despite this, most in the Iliac Bay region saw the Orcs as villains, beneath contempt. In 3E 402, the War of Betony broke out between the kingdoms of Daggerfall and Sentinel. While historians recorded that Daggerfall's King Lysandus was felled by an arrow during the climactic battle at Cryngaine Field, he was actually slain by treachery before it. Wayrest, which had remained neutral in the conflict, sent delegations to meet with the warring kings on the eve of the battle. Among those sent to meet King Lysandus was Lord Woodborne, a minor noble who secretly schemed to usurp the throne of Wayrest. While some sources claim it was Gortwog and his Orcs who slew the king on Woodborne's orders, in truth, Lysandus was assassinated by Lord Woodborne himself. King Lysandus had supported Gortwog's claim to sovereign rule. When Gortwog got word of the planned assassination, he sent his archers to waylay and attack the Wayrest delegation en route, despite knowing that this act would damage his efforts at Imperial recognition. The Orcish warriors were slain in the attempt. In 3E 401, Emperor Uriel Septim VII learned that Lord Woodborne had acquired the Totem of Tiber Septim, an artifact which allowed its bearer to control Tiber Septim's ultimate weapon, Numidium. He wrote to Queen Mynisera of Daggerfall, asking her to use her influence with the court of Wayrest to try and recover the Totem. Unfortunately, the letter never reached her, its delivery delayed by the War of Betony. When it arrived, Lysandus' son Gothryd was the new King, and as the letter was addressed to "the Queen of Daggerfall", it was delivered to the new Queen, Aubk-i. The letter didn’t remain secret for long; it was stolen by the Thieves Guild and sold to the highest bidder, Gortwog. It is believed he then sold copies of the letter to the major powers of the Iliac Bay region, as the Orcs stood to gain much from the resulting conflict. When the ghost of King Lysandus began haunting the city of Daggerfall, it attracted the Emperor's attention. Uriel VII sent an agent of the Blades to investigate, and to search for his missing letter (though he downplayed its significance). This agent crossed paths with Gortwog several times, and even braved the dungeons beneath the steel citadel of Orsinium to retrieve the Emperor's missing letter. On another occasion, Gortwog had obtained and intended to publish copies of a suppressed book, the contents of which would cause considerable embarrassment to Queen Barenziah of Wayrest. The queen hired the agent to retrieve the tome, which turned into a race against the Necromancers for the manuscript. The Orc chieftain also provided the agent with the whereabouts of a magical ingredient to soothe the spirit of King Lysandus, for which Gortwog gained the sorceress Medora Direnni's support of his claim to the heart of Tiber Septim. Ultimately, the agent recovered the Totem of Tiber Septim, which set off a bidding war between seven major powers in the Iliac Bay region. Gortwog made his case plainly, offering a legendary artifact (rumored to have been either the Warlock's Ring or the sword Chrysamere) in exchange. The Orc king was given the Totem, though curiously, the other six powers were also simultaneously given the artifact. After the agent retrieved the Mantella from the plane of Aetherius, Numidium was ready to be activated. And on the 9th of Frostfall, 3E 417, it was. Time and reality became "warped" as the seven powers used a Numidium to their own ends, giving the phenomenon its name, the Warp in the West. Three days merged into one, though events progressed further than even three days could account for; among the known occurrences was a titanic three-way battle between Daggerfall, Wayrest, and Orsinium midway between their kingdoms that left the surrounding countryside "decimated". The Warp ended as suddenly as it began, and as a result Orsinium was one of but four kingdoms that remained in the Iliac Bay region. 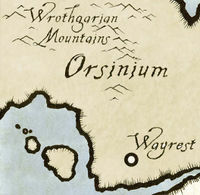 Orsinium's borders were greatly expanded to include much of the Wrothgarian Mountains, as well as parts of the Bjoulsae Rivercoast and Hammerfell. 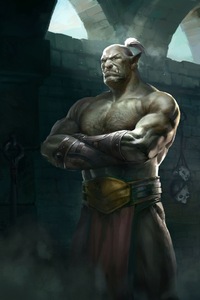 King Gortwog's struggles had not been in vain; the Orcish people were given equal status among the races of the Empire, and within ten years Orcs could be found across Tamriel, in all walks of life. By 3E 432, the Iliac Bay was at peace, and Nova Orsinium was recognized as a kingdom of High Rock by the Empire, though King Gortwog continued to press for elevation to Provincial status. Orsinium was not wholly without conflict, however. King Gortwog established a new priesthood devoted to the worship of Trinimac, the ancient Orcish Hero, who according to legend was devoured by Boethiah and became the Daedric Prince Malacath. Traditionally, the Orcs had worshipped Mauloch (another name for Malacath). Gortwog, however, believed Trinimac was still alive, and that he and Malacath were separate entities. This became the official stance of the shaman priests of Orsinium, and further, that Malacath was a demon who wanted the Orsimer to remain pariah folk forever. To some traditionalist Orcs within Orsinium—and most Orcs without—these beliefs were dangerously heretical. The outcome of this religious schism is not known, but worship of Malacath outside of Orsinium was still strong well into the Fourth Era. Corpse Preparation v I mentions a delegation of necromancers sent to Orsinium to petition King Gortwog to allow their practice there. For game-specific information, see the Daggerfall and Legends articles. This page was last modified on 3 February 2019, at 06:00.